Happy Birthday, Randolph Scott. | 50 Westerns From The 50s. What a terrific poster. Wish this artist had done more of the Scott westerns. 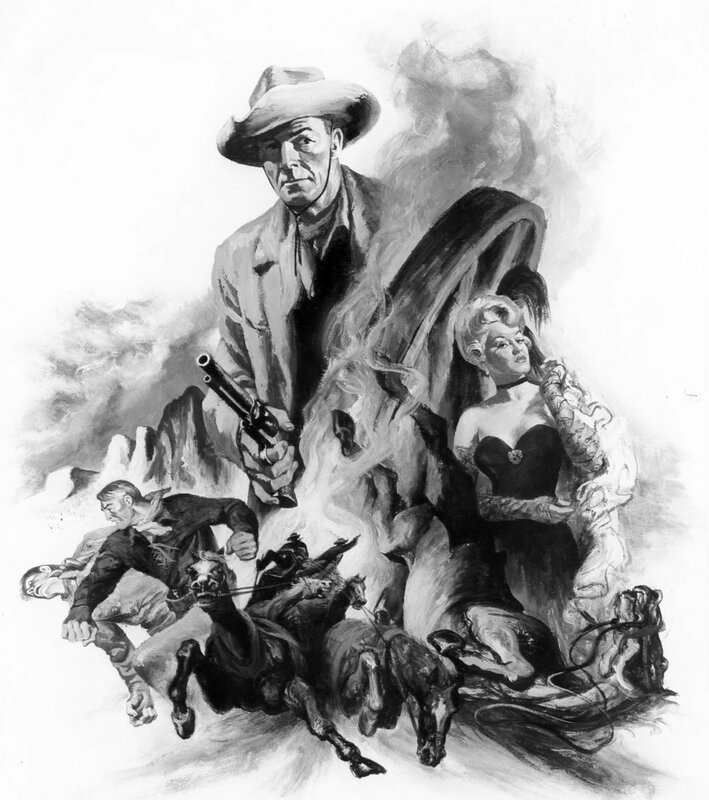 Rehberger did other great Western posters — The Hanging Tree, Cheyenne Autumn and Major Dundee. His art for One-Eyed Jacks wasn’t used, which baffles me. Wonderful piece of artwork and a most suitable way to celebrate the birthday of this giant of western films. HAPPY BIRTHDAY RANDOLPH SCOTT! My favorite Western Movie Star of all-time. A really top-notch poster artwork by Gustav Rehberger. if the film had been as good as the art work, would have been pretty good, which it is not. Randolph Scott can do no wrong with me. He and Joel McCrea are always rotating the top spot of my favorite A-level western star. Luckily, Scott’s westerns are all pretty reasonably accessible (other than maybe the 3d versions of a couple), while some of his earlier, pre-war films are occasionally quite elusive. For example, I haven’t seen in eons the Civil War drama “So Red the Rose” (1935-Par), in which Scott supported Margaret Sullivan. Only have hazy memories of it. Looking over Scott’s filmography at Imdb, I was trying to figure which of his movies has been ‘most’ elusive to me. Although they were both probably packaged for tv-syndication by MCA, there are two films I’ve found really hard to run into. One is “And Sudden Death” (1936-Par), which features Scott as a police lieutenant in charge of the traffic department, who is combatting speedy/reckless driving. The other is a little comedy, “The Road to Reno” (1938-Univ), in which Scott is a ranch-owner who is trying to forestall his opera-singer wife from getting a divorce. I doubt either film is any great shakes, but with Scott in the lead, I’d like to give ’em a whirl. Scott was admittedly in a wide variety of films in those earlier years. You don’t really think of him in horror films, but there he is in “Supernatural” (1933-Par) and the notoriously gruesome “Murders in the Zoo” (1933-Par), not to mention our hero in the original version of “She” (1935-RKO), which I rather like. I suppose the most seemingly unlikely film for him is “Hello, Everybody” (1933-Par), which starred hefty radio songstress Kate Smith. As I recall the plot, Smith has an unrequited love for Scott, but he (naturally) only has eyes for her sister, played by Sally Blane. I have an old copy on vhs around here somewhere. Anyway, no Boetticher or De Toth in Scott’s salad days, but there are still a lot of interesting curios here and there for the truly devoted Randolph Scott fan. Welcome back Bert,you have been quiet for a while. socialite with a penchant for fast cars and reckless driving. Randy plays a flaky,unreliable womanising Coast Guard officer. direction from underrated Edward Ludwig. increasingly dangerous missions-you can guess the rest. with being married to Joel and all. In COAST GUARD her attitudes are surprisingly contemporary. fascinating relic of its era. Yipe! You would have to mention “Blood Money” (1933). As someone who adores Frances Dee, that rather unsavory little film and Dee’s near-psycho character always gives me the shivers. Disturbing. I made an off-air recording of the film nearly 30 years ago, as it was a part of that somewhat rarely-seen, syndicated package of fifty early Fox films. Although technically, “Blood Money” was a Twentieth Century production released through UA at the time, but after the company merger became a part of the Fox library. Frances Dee and George Bancroft had already starred together in “Rich Man’s Folly” (1931) for Paramount, but in that one they played father and daughter. I have an original still of the two of them from it, but I’ve never seen the film itself. Lot of those Paramounts featuring Dee at the beginning of her career that I haven’t seen. I’m guessing that this upcoming Capitolfest later this year will screen some of these, in their spotlight on McCrea/Dee. John, Nothing unwholesome about this, but in 1950 Joel and an affair with a lady in Oregon. A child, Mona Leigh McCrea, still very much alive, was produced. She can be tracked online. Very cute. Barry Lane ,I do hope that Joel did the right thing and looked after Mona and acknowleged her as his daughter ,I certainly would have but I don’t know the circumstances in this case.I don’t judge actors and actresses on their private lives because although some of it may be true and has been proven to be true ,a lot of it is just gossip .Scott and McCrea were two great actors ,but if I had to choose ,McCrea would be number 1 between the two of them. Put her in your search engine and see for yourself, John. Might be interesting. Thanks for the link Barry,fascinating. But did you put Mona up. The other things are at the level of Confidential, which is negative. Mona McCrea is not at all that. Bert, always has good information on some, nowadays, rarely seen movies. Yes, there are no Boetticher or De Toth movies here, but SO RED THE ROSE(1935) was directed by King Vidor. The movie was set during the War of the Rebellion and is told from the Southern Confederate viewpoint. Mississippi native Stark Young’s novel SO RED THE ROSE(1934) was the third best selling novel that year according to Publishers Weekly. The 431 page novel was considered as the archetype of the Southern War of the Rebellion novel and also dealt with the aftermath of the war. In 1935 the movie was made by Paramount Studios, starring Margaret Sullavan, Walter Connely, and Randolph Scott. The phenomenal successes of Margaret Mitchell’s GONE WITH THE WIND(1936) and its film adaptation of 1939 pushed Young’s book into the background, as well as the movie. I was fortunate enough to see “SO RED THE ROSE” on the big screen at London’s National Film Theatre. It must have been around 1970-73. I enjoyed the film very much, as I recall, but have never had the chance to see it again. It deserved to be better known. Jerry, I agree that SO RED THE ROSE(1935) should be better known, because it is different from GONE WITH THE WIND(1939). In Stark Young’s novel the little known subject of Southern Unionism was addressed. Not every Southerner was a Confederate. Not every slave owner wanted to secede from the Union. In the book some of the aristocratic plantation owners of Natchez, Mississippi wanted to remain in the Union. The scriptwriters of the movie dwelt with this by having Duncan Bedford(Randolph Scott) not wanting to fight other Americans. Bedford tells neighbor George McGehee(Charles Starrett) that he had went to school in the North and had friends there, just as George had. McGehee rides away, having been joined by Edward Bedford’s(Harry Ellerbe) Texan friend and classmate George Pendleton(Robert Cummings). Before he leaves, McGehee tells Duncan Bedford that he always knew that Bedford plantation raised good horses, insinuating that no good men were raised there. Not everything was cut and dried in the Southern Confederacy, and SO RED THE ROSE attempted to show this in 82 minutes. I hope by now my fellow westernistas have all read (and maybe commented) on Laura’s latest fine piece over at Classic Movie Hub. But in case you hadn’t yet realised it was there……..
Jerry,just checked out Laura’s review on CANYON PASSAGE .I love the film version of OLE BUTTERMILK SKY at the end of the film .Notice how Hoagy Carmichael stops and half turns .I wonder if he was mean’t to keep going a little longer. I received a special edition BLU RAY copy of ONCE UPON A TIME IN THE WEST in a nice wooden box complete with mouth organ and cigarette lighter ,poster and booklet from Germany.The booklet had two of the pages stapled in upside down and two not stapled in at all .If I want to fix it I’ll have to watch an unboxing because I cant read German and the pages are not numbered . That’s a shame about the booklet, Graham but I imagine the film looks just terrific. Jerry ,haven’t yet got round to viewing it yet .I ordered it in November 2018 and it arrived in January 2019 due to the seller’s work commitments overseas,but he apologised for the delay and he gave me a discount. Jerry ,I would be interested in your opinion or anyone elses about my comment on the CANYON PASSAGE ending with Hoagy.It’s only a small thing I know ,but just wondering if anyone else noticed. Jerry ,problem with the booklet solved .I took it to a book binder and he put the pages back in their proper order and restapled it .He didn’t charge me ,even though I offered.I bought this 5 film western classics from Spain .The films are -RAILS INTO LARAMIE ,PASSAGE WEST ,GREAT DAY IN THE MORNING ,THE BRAVOS (1972 TV Film ) and SANGRE EN LA PRADERA (no English ).The rest have English but the transfers are not the best with RAILS having one or two gaps in dialogue.It comes in normal cases with a cardboard wrap around cover with no bottom or top lid. The book binder – gives you faith in human nature, does it not, Graham?! Jerry ,he was such a nice guy the way he lined up the pages ,using the background to match them.He was about my age ,maybe a little younger and I asked him if he knew the film which he did not ,but films and TV were not high on their interests. MADIGAN getting released on BLU RAY by Kino Lorber looks good -Richard Widmark “now be a good boy and drink your milk “. Graham, I went back and viewed the end of CANYON PASSAGE(1946). Yes, I noticed the stop and half-turn of Hoagy Carmichael. I had never really paid attention to it before. Good eye. I’m glad you were able to get the booklet fixed. There are still a lot of nice people in our World. Walter ,I guess I noticed Hoagy’s half turn listening to OLE BUTTERMILK SKY with Frank Skinner’s music hoping for a longer version .It’s always hard to beat the film versions of some of these songs.You’re right about a lot of nice people in our world .It would have been a nightmare trying to get a replacement booklet considering this was an Amazon De exclusive and I bought it on E Bay and it would have been out of the seller’s control . You don’t have to look far to find nice people .Some of the nicest are right here on FWOTF. Graham, I agree with you about there being some of the nicest people right here on FIFTIES WESTERNS. Thank you so much, Jerry, I’m enormously grateful to you for mentioning it and for everyone who’s taken the time to read it, as well as my earlier pieces. I’m very glad to have a forum to help spread the love of Westerns. Thoroughly enjoyed Toby’s post and am making my way through all the comments! Hopefully 2019 will bring us more Randolph Scott blu rays. I just recently purchased a photo of R Scott and Sam Snead from 1960 Celebrity Golf TV Show. Two of my favorites. Tom, I’m sure that is a neat photo. Randolph Scott was in retirement by then, but he would come out of retirement to film RIDE THE HIGH COUNTRY(1962). I have seen the occasional Celebrity golf series show with Snead playing 9 holes against a celebrity – kind of enjoyable primarily to see the personality of the celebrity. The ones I have seen include episodes with Robert Wagner & then Jim Garner – both of whom were good golfers. I know that Randolph Scott did one and I hope to see it some day but so far no luck! I have looked for years and could not find it either. I have some obscure Snead All Star Golf matches on dvd & 8mm film, but have never com across Scott vs Snead film. Scott looks much older in the 1960 photo than he did in High Country. Great makeup artists. Now I understand why he decided to hang it up after making Comanche Station in late 1959 with Boetticher. Some of these Sam Snead CELEBRITY GOLF(1960-61) shows can be seen on YouTube. James Garner, Robert Wagner, Dean Martin, Harpo Marx, and Robert Sterling.